Is Meguiar’s Ultimate Liquid Wax the best car wax? Howdy there! I’m Vince and today I’m writing a Meguiar’s Ultimate Wax Review. If you’ve been around cars for longer that 30 seconds, you can tell the ones that have been taken care of and the ones that have been beat into the ground. I’m the kinda guy that takes great pride in my truck – a deep black 99 Dodge Cummins ext cab – and let me tell you the #1 best way to prolong that black paint on your car or truck…. YOU GOTTA WAX IT! Yeah wax… Oh wait, not this kind! I am a huge fan of almost anything from Meguiar’s, but I particularly prefer their polishes and waxes over other popular brands like Mother’s and Chemical Guys. I have nothing against the aforementioned competitors, but I grew up waxing and polishing my dad’s Nissan Sentra, Maxima, and Altima using nothing but Meguiar’s. As it turns out, father knows best when it comes to car detailing products since I love the way that the products are easy to apply, painless to remove, and gives the paint a fabulous mirror shine. It’s not just the nostalgia, either. When I got my first car, the first thing that I did (besides scream girlishly in absolute joy) was to buy a bottle of Meguiar’s Gold Class Liquid Wax. Depending on my work scheudle, waxing turned into a bi-monthly affair. But while the Gold Class stable remains an all-time favorite, Meguiar’s now has the Ultimate line of car care products, one of which is the Ultimate Wax. This is my Meguiar’s G18216 Ultimate Liquid Wax review, and I am raring to find out if this can upset the Gold Class Wax when it comes to protection, appearance, and shine. 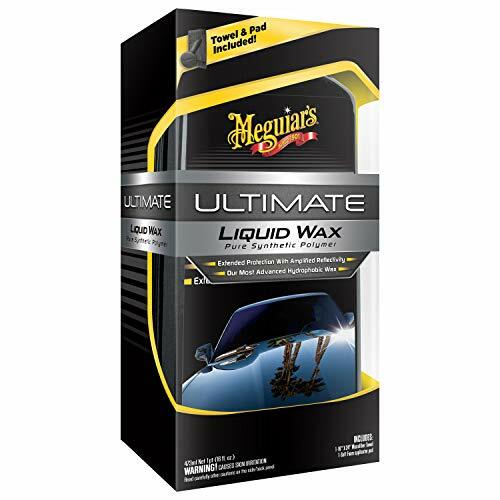 The Meguiar’s Ultimate Liquid Wax is also available in paste form. But for this review, I will be using the liquid form of the wax on my old but relentless 2012 Honda Civic Si with OEM Rallye Red paint. I felt like a winner while I was reading the product descriptions of the Meguiar’s Ultimate Liquid Wax. Meguiar’s claims that this is the most advanced pure synthetic wax in the lineup and is a true hydrophobic wax. This liquid wax is engineered using advanced synthetic polymers to provide long-lasting protection and shine, even longer than what Gold Class can provide. What does ‘hydrophobic’ wax mean? It’s simply a new term used to describe water beading on the paint, although a hydrophobic wax will enhance water sheeting while still leaving some water beads that rolls easily off the paint. What really caught my attention was the ThinFilm Technology of the Meguiar’s Liquid Wax. This makes the wax extremely easy to apply and remove, even when waxing under the hot sun! Sounds amazing, right? In truth, I would NEVER wax a car under direct exposure to sunlight, since I am in no mood to acquire skin cancer while detailing my ride. Besides this obvious inconvenience, the wax is harder to remove when baked to a crisp, and it makes the process more tedious altogether. But still, it’s a nice feature of the wax. Before applying the Meguiar’s Ultimate Liquid Wax on my Civic, I washed the car using water and car shampoo. I also used a clay bar on some areas of the paint. At this point, I wanted to apply a thin layer of polish to complete the surface preparation prior to applying wax, but the paint was still a decent since I religiously maintain my car’s paint. After mildly prepping the surface, I grabbed a clean applicator pad and applied the Ultimate Liquid Wax in each section of the car. I decided to apply tape on the middle of the hood to compare the Meguiar’s Gold Class with the Meguiar’s Ultimate Liquid Wax. I applied the former on the left side and the latter on the right side of the hood. This will truly show me the visual difference between the two products. It is important to point out that one of the golden rules of waxing or polishing is to only use a small amount of product on each section of your ride. Applying an overly thick coat will NOT give better results. The good thing about the Meguiar’s Ultimate Liquid Wax is you can accidentally apply it on plastic or rubber trim without worrying about white stains. It is still a good idea to prevent applying the product on black plastic and rubber trim, but it’s good to know that you can easily wipe off the dried residue without worrying about stains or discoloration. I allowed the wax to dry for about 10 minutes. Of course, the advanced polymer technology of the Meguiar’s wax means you can wipe off the residue even while the product is still wet to the touch, but I prefer the wax to dry before buffing the finish. The easiest way to determine if the wax is dry is by performing a simple swipe test. Run your clean index finger across a waxed surface. If the wax smears off, it needs to cure for a couple more minutes. If you have a clean swipe, this means the wax is dry. After removing the residue, I grabbed a hose and sprayed water on the hood. I can honestly say that the difference between the Meguiar’s Gold Class and the Meguiar’s Liquid Wax offered almost the same level of water beading protection, although there were fewer and smaller water beads on the right side of the hood (which was treated with the Ultimate Liquid Wax). In terms of shine, the results were almost the same. In fact, both products gave the hood of my Civic a flawless shine. Both products were easy to wipe off, but I guess the main difference is the durability of the Ultimate Liquid Wax over the Gold Class. Since the Ultimate Liquid Wax is engineered using advanced polymers, you can expect longer lasting shine and protection with a single application. And hey, if you decide this isn’t the best wax for you, check out our ultimate vehicle wax guide that Matt did a few months back. Before using the Meguiar’s Ultimate Liquid Wax in this review, I wasn’t a big fan of polymer-based waxes or polishes. But after spending an hour or so detailing my Honda Civic, I think I have a new favorite. I still love the Meguiar’s Gold Class, but I’ve found Meguiar’s Ultimate Liquid Wax is easier to find these days and last longer on the paint while it protects and adds a brilliant and glossy shine. The fact that you can use it while the car is exposed to the sun is a huge plus in itself, although the word of the wise states that only fools will do such a thing.